Jean-Joachim Goriot, a widowed and retired wheat dealer who sold his business, lives alone in a pension in Paris. Since the death of his wife Father Goriot has doted on his daughters, Anastasie and Delphine, giving them anything they desire. He’s now coming to the end of his finances while they are married for money and title but continue to need his assistance (although they shun him). Eugene de Rastignac, a new arrival to Paris also lives there and, with the help of money from his poor family, is interested in being introduced to high society via his cousin, Madame de Beauséant. Eugene meets Goriot’s daughters and tells the old man about their doings. the rest of  your days." 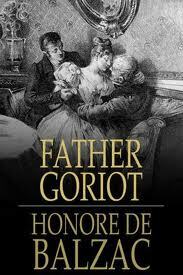 I suppose Father Goriot could be a scathing social satire if there were any humor in it – there’s not – it’s an accurate reflection of the situation in Paris at the time. The boarding house is located in an isolated corner right between the poorest and the wealthiest neighborhoods in Paris – the residents are scrambling to either climb or to keep from sinking. into it in your own  life, perhaps even in your own heart”. Balzac is considered the father of realism. This story is a part of Baltzac’s “The Human Comedy” series. Originally published in serial form during the winter of 1834/35, Le Père Goriot is widely considered Balzac’s most important novel. It marks the first serious use by the author of characters who had appeared in other books, a technique that distinguishes Balzac’s fiction. The novel is also noted as an example of his realist style, using minute details to create character and subtext. The novel was released to mixed reviews. Some critics praised the author for his complex characters and attention to detail; others condemned him for his many depictions of corruption and greed. A favorite of Balzac’s, the book quickly won widespread popularity and has often been adapted for film and the stage. It gave rise to the French expression “Rastignac”, a social climber willing to use any means to better his situation.